IJ client Hector Ricketts challenged the transportation monopoly in New York City and won. His private vans continue to put people to work and take people to work. The transportation business is quintessentially suited to immigrant or low-income entrepreneurs. Running a taxicab, jitney, sedan or limousine service requires little in the way of formal education or startup capital. With a safe vehicle and a strong work ethic, entrepreneurs can be on their way to the American dream. But outdated restrictions, often defended by established businesses, including the powerful taxi industry, often prevent these aspiring small business owners from working freely. The Institute for Justice is determined to fight laws that needlessly limit competition and constrict consumer choice. Since our founding in 1991, IJ has opened transportation markets in Cincinnati, Denver, Indianapolis, Las Vegas, Milwaukee, Minneapolis and New York City. In 2016, we secured a landmark pair of wins in federal court on behalf of ride-hailing and taxi drivers in Chicago and Milwaukee. We also launched—and won—a new case challenging Little Rock’s taxicab monopoly. IJ’s work has been featured in The Atlantic, USA Today, The Wall Street Journal, NPR and The Washington Post, among many other prominent media outlets. For generations, transportation businesses have been a vehicle by which people raised themselves and their families out of poverty. Not only do these businesses provide a promise of economic opportunity, they offer safe and affordable transit for communities that would otherwise have few options for reliable transportation. In many lower-income communities, simply getting to work is often a major challenge. Taxis are virtually non-existent, and cars are prohibitively expensive. Residents must depend on public transportation, which is notoriously sporadic and unreliable. Unfortunately, many cities and states have enacted regulatory roadblocks. These regulations do precious little to protect the public. Rather, they protect entrenched businesses from competition. 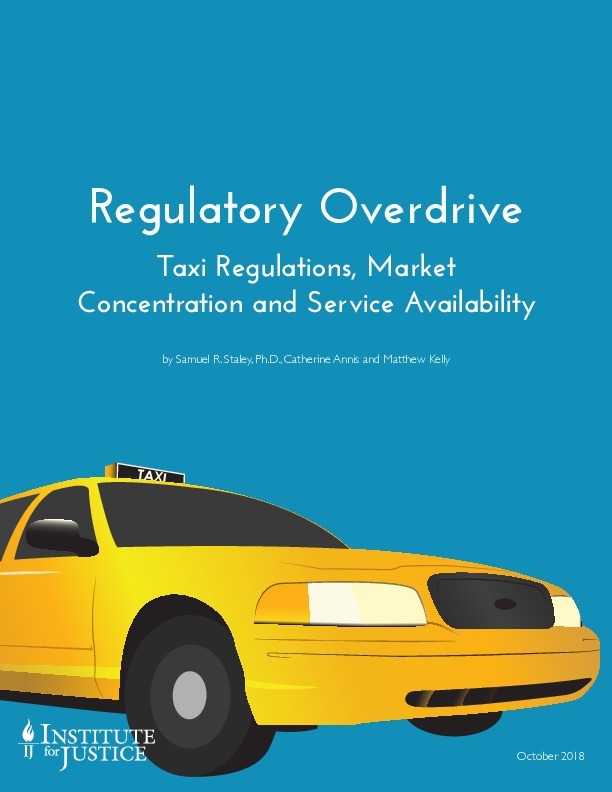 One of the most common regulations is a taxi medallion, or permit, required to own a cab. In cities with a medallion system, entrepreneurs can operate a cab only with a medallion. This creates artificial scarcity, which grossly inflates the price of a medallion. Today, taxi medallions in several cities cost entrepreneurs hundreds of thousands of dollars, clearly putting them well out of reach of those with limited means. The goal of protecting entrenched businesses, protectionism, is even more blatant in cities that mandate minimum wait times and minimum fares. These restrictions ban transportation entrepreneurs from offering competitive fares and better service to their customers. Additionally, IJ has defended cities that enacted reform from specious lawsuits filed by cab cartels. Consumers and entrepreneurs, not government officials, should decide what transportation options are available.